The Open Banking evolution continues to unfold. Banks risk disintermediation if they do not carefully 1) choose their customer-interaction business model role, and 2) use application programming interfaces (APIs), according to the World Retail Banking Report 2017. Banks, in collaboration with FinTechs, can lead the Open Banking movement by offering their customer bases innovative and personalized services that create new revenue streams and provide more value to customers. “FinTechs are now earning higher positive customer experience scores than traditional banks, and banks are openly seeking to collaborate with FinTechs," says Anirban Bose, Global Head of Banking and Capital Markets, Capgemini. “Open Banking offers banks an opportunity to retain and grow their customer base as they add the varied services of third parties to personalize and customize products and services. For banks that don't think strategically and establish a role in Open Banking, there is a chance they will be disintermediated from their customers. It is imperative that banks consider business transformation approaches now, to establish and solidify their long-term base in Open Banking." 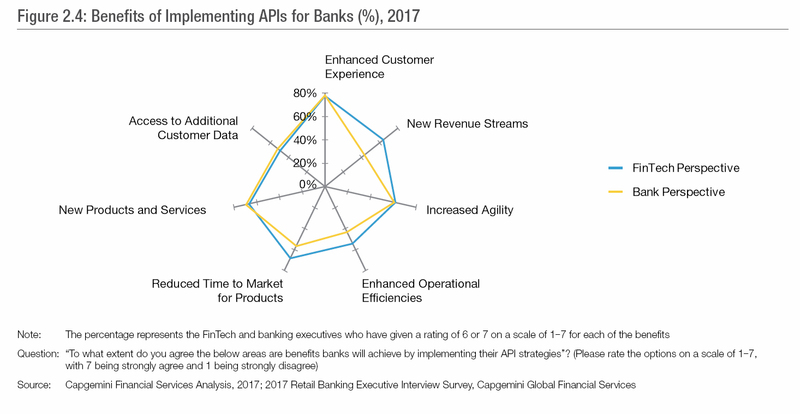 The World Retail Banking Report 2017 details how APIs offer a pathway toward Open Banking, where FinTechs and financial institutions collaborate rather than compete to create customer-centric solutions. Though APIs raise some security and privacy concerns, they are seen as crucial in allowing banks to take advantage of FinTech ingenuity without having to make major changes to existing infrastructures. “The most successful banks will use open APIs to generate new customer insights and revenue streams, while also improving customer experience," explains Vincent Bastid, Secretary General, Efma. “Many banks currently use APIs internally to improve information flow between legacy systems. In fact, we are already seeing early adopter banks asserting their role in Open Banking by proactively making their systems and data available to third parties and creating new revenue streams." Exactly how the evolution toward Open Banking will play out is far from clear. A majority of FinTech respondents (53.8%) and banks (43.5%) envision a future in which banks and FinTechs work together to build cross-industry platforms with bundled, complementary services that benefit customers. A less likely but still plausible outcome, is that banks will continue to provide products and services but leave distribution to FinTechs, BigTech, or other new open platforms. This has the potential to lower customer acquisition costs but raises issues related to disintermediation branding and customer ownership. Nearly half (47.8 percent) of banks predict this future scenario compared to only 28.8% of FinTechs. This year's World Retail Banking Report also quantified the robust appetite for closer partnerships between FinTechs and banks going forward. The vast majority of banks (91.3%) and most FinTechs (75.3%) say they expect to collaborate in the future, with banks providing access to their broad resources, experience and expertise, and FinTechs offering agility, speed to market and a fresh take on customer-centricity. By working together and taking advantage of APIs, banks and FinTechs can leverage their complementary strengths, enhancing the customer experience much more than each entity could do on its own. “We work with clients every day who tell us that they are looking to better understand the roles they should play as these new business models take shape; everything from the investment necessary to how to engage with these new players. Many understand that Open Banking is the new normal, but they are still unclear about how to proceed," continues Bose. “We are helping our clients see first-hand just how Open Banking opportunities are improving their product portfolio and distribution networks, as well as creating new revenue streams, while minimizing the risk of customer disintermediation." FinTech companies have done a good job of cracking the code on what customers want, which presents a threat to bank-customer relationships, the report found. BigTech companies like Amazon, Apple and Facebook are conditioning customers to expect more from their banks and the experience they provide. Because of this, customers are embracing FinTechs, with 40.3% saying they deliver a positive experience, compared to 37.1% who say banks do. FinTechs are most popular in North America, where 57.8% of customers say they offer a positive experience, compared to 49.5% who cite banks. Globally, customers who are young and tech-savvy are the most likely to turn to FinTechs. APIs make it easier to create innovative and valuable customer experiences by pooling the collective tribal knowledge of banks and FinTechs. Challenges to Open Banking development include the need for governance and consistent technology standards. Additionally, banks must determine their role in Open Banking, how to effectively personalize customer data, and how to prepare for new revenue opportunities.